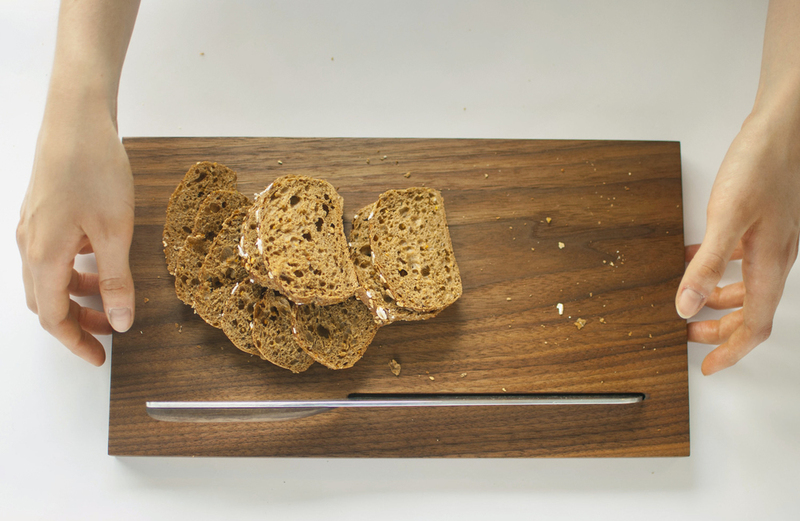 It all started with my fascination for cutting thin slices of bread. Soon I realized a regular bread knife allows you to do it. The trick is not in the blade or in the cutting board but in the patience and care of how you use them. The challenge was to design a knife that invites you to care. Shaping would play an important role on how the knife communicates. The way an object looks defines in great way how we use it. After trying out different models, shapes and proportions the profile of the knife was defined. With a razor-like design but gentle edges and a thin wooden grip, it is intended to give you a feeling of precision without looking aggressive. Going for a one sided grip brings the knife closer to the way you use a cutter or blade - it lets you feel the metal on one of its sides while you cut. A small grip makes it clearer that you shouldn't use strength but patience to cut with precision. The knife was missing a place to be and the cutting board became this place. It has a vein cut that works as the stand for the knife and a shape that is not intrusive. I chose walnut wood both for the knife's grip and cutting board due to the way it feels, its hardness, color and beautiful structure. Both the surfaces of the knife and its pair were hydrated with walnut oil and sanded finely.